Hagerstown, MD - The Hagerstown Suns, Class-A affiliate of the Washington Nationals, are pleased to welcome Shawn Murnin as the team's new Director of Media Relations and Broadcasting. He will serve as the Suns primary media contact as well as the Voice of the Suns for the 2018 season. Murnin, who was the Media Relations and Broadcast Assistant for the Midwest League's Peoria Chiefs (Class-A/St. Louis Cardinals) in 2017, replaces Kevin Gehl who is leaving to pursue other opportunities. "We are very excited to be adding Shawn to our staff for the 2018 season," Suns GM Travis Painter remarked. "Shawn brings a great work ethic and enthusiasm that will be evident on all of our 2018 home broadcasts." Murnin joins the Suns after spending last season with the Chiefs where he was the team's number-two broadcaster while executing a host of media relations responsibilities. In the two years prior, he was the Director of Broadcasting and Media Relations with the for the Mankato MoonDogs in the collegiate summer Northwoods League and received the 2015 Northwoods League Play-by-Play Announcer of the Year award. "I'm really excited for the opportunity to work with Hagerstown's front office while bringing Suns baseball to fans from all over," Murnin said. "I'm looking to improve on the great experience Kevin Gehl gave fans in 2017 while bringing my own style and personality to every broadcast." The 29-year-old spent 2011 as a Broadcasting and Media Relations Assistant with the Scranton/Wilkes-Barre Yankees (Triple-A/Yankees) and is a 2011 graduate of East Stroudsburg University of Pennsylvania, where he was the sports director of the school's student-run radio station, 90.3 FM WESS. While at ESU, Murnin called football and baseball games and co-hosted a weekly radio program. 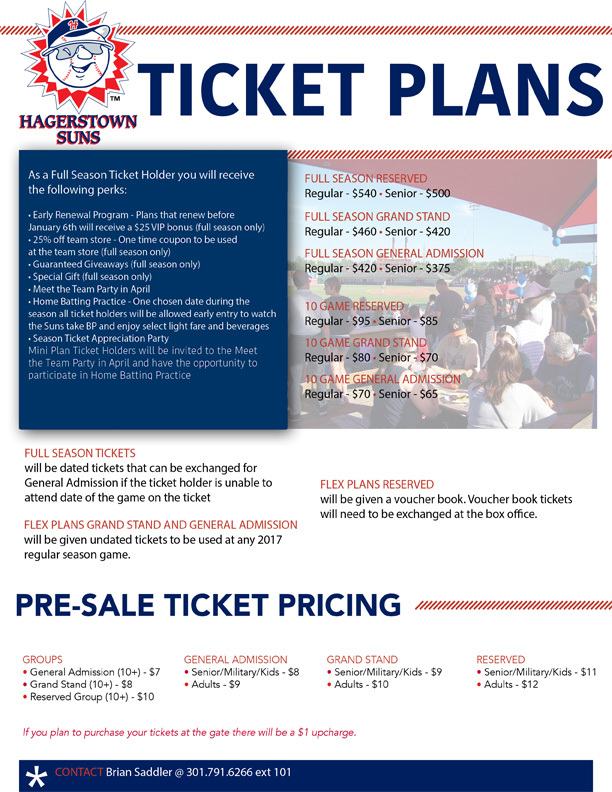 Ticket packages are available for the 2018 season by calling (301) 791-6266 or ordering online. The 2018 season starts on Thursday, April 5 in Rome, GA with the home opener April 12 against the Greensboro Grasshoppers. Fans can listen to the action by logging on to hagerstownsuns.com or the TuneIn Radio App.